Enjoy this modern, fully equipped, executive retreat with an abundance of privacy. Relax to mesmerizing sunsets in this beautiful, architecturally designed four-season lakefront vacation home. 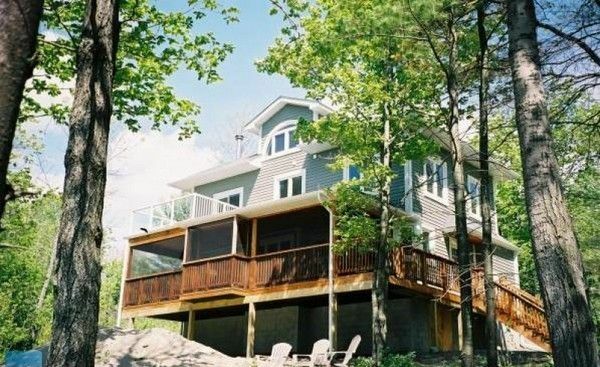 Nestled in a natural setting of trees and Canadian Shield rock, you'll revel in natural privacy on approximately 3 acres and 200 feet of prime waterfront. A sandy beach and entrance way to lake, leads to a warm shallow safe swimming area for children; deeper farther out for adult swimming. There is great fishing on this serene lake. The cottage, called Time to Exhale, is on a private lot on Morrison Lake. The lake is located above the Severn waterway and below Lake Muskoka , the closest town is Gravenhurst. Morrison Lake is a warm clean lake located in the Muskoka region and is only an hour and forty five minutes north of Toronto. Large driveway which backs right up to the cottage. Gate at the end of the driveway. Weekly garbage and recycling pick up. This larger, well maintained, upper-end property with modern amenities is available year round. We have people usually arrive on Saturday any time after four O'clock and stay until the following Saturday with noon being the check out. We always want to avoid any overlap with one family leaving and another arriving. We usually stop by the property on Saturday afternoon, to do maintenance on the cottage and also look after the property. $3,300 per week during high-season (for July and August, 9 weeks). $1,700 per week during mid-season (early summer or early fall). $1500 weekly, off-season during other times of the year. $900 for two nights weekend during off-season, $250 for each additional day. $1,000 security/damage deposit cheque required at booking. The cheque can be post dated to the first day of your holiday. This cheque would be for damages, unexpected additional cleaning, or extra guests that were not agreed to. After your stay, if there were no problems, the cheque will be returned to your address by mail. Children's sand toys and pool noodles, are under the porch, and are available for use. There is a sandy beach with several Muskoka chairs facing the lake, this is a great place to spend an afternoon. There is also another sandy area closer to the cottage for the kids to play. The child friendly lakefront starts out shallow and gradually becomes deeper, with a soft non-rocky bottom. We have left much of the lake front as natural habitat the way it has always been, except for a clear entrance to deeper water swimming. Kids will love the small fish that can be seen in the shallower areas. The neighbouring cottages are situated far enough away as to provide total privacy. Down by the lake there is a small red canoe and two adult kayaks, the life jackets of various sizes are under the porch. There is a fire pit and chairs by the lakefront and dry firewood under the porch. Also down by the lake is a hammock, horseshoe area, and picnic table. A game of boccie ball or horseshoes is a great pastime. A nature path leads from the road to a private common area adjacent to the property. The common area is a maintained big grassy area to play, with a small sandy beach and a long dock. The dock is only used by a couple of boats and is a great spot for fishing or jumping and swimming off the end. The dock is also a nice place to take a walk to, and enjoy the sunsets. Another nature path leads from the common area, follows the lakefront and goes to a shared full sized fenced tennis court. Enjoy a game of tennis, the cottage has some tennis rackets and balls on the porch. As for fishing; large and small mouth bass, perch, muskie, and pike. Catch and release is the best fishing practice. Fishing licences for adults can be obtained from the Gravenhurst Canadian Tire store or the outfitter stores, on the highway, where bait is sold. Children&#039;s sand toys and pool noodles, are under the porch, and are available for use. There is a sandy beach with several Muskoka chairs facing the lake, this is a great place to spend an afternoon. There is also another sandy area closer to the cottage for the kids to play. The child friendly lakefront starts out shallow and gradually becomes deeper, with a soft non-rocky bottom. We have left much of the lake front as natural habitat the way it has always been, except for a clear entrance to deeper water swimming. Kids will love the small fish that can be seen in the shallower areas. The neighbouring cottages are situated far enough away as to provide total privacy. Down by the lake there is a small red canoe and two adult kayaks, the life jackets of various sizes are under the porch. There is a fire pit and chairs by the lakefront and dry firewood under the porch. Also down by the lake is a hammock, horseshoe area, and picnic table. A game of boccie ball or horseshoes is a great pastime. A nature path leads from the road to a private common area adjacent to the property. The common area is a maintained big grassy area to play, with a small sandy beach and a long dock. The dock is only used by a couple of boats and is a great spot for fishing or jumping and swimming off the end. The dock is also a nice place to take a walk to, and enjoy the sunsets. Another nature path leads from the common area, follows the lakefront and goes to a shared full sized fenced tennis court. Enjoy a game of tennis, the cottage has some tennis rackets and balls on the porch. $3,300 per week during high-season (for July and August, 9 weeks). $1,700 per week during mid-season (early summer or early fall). $1500 weekly, off-season during other times of the year. $900 for two nights weekend during off-season, $250 for each additional day. $1,000 security/damage deposit cheque required at booking. The cheque can be post dated to the first day of your holiday. This cheque would be for damages, unexpected additional cleaning, or extra guests that were not agreed to. After your stay, if there were no problems, the cheque will be returned to your address by mail.